Ethiopia is serious about eliminating river blindness and has the laboratory to prove it. The laboratory, in Addis Ababa, opened in October 2015 as the Ethiopia Ministry of Health shifted from merely seeking to control the disease, technically called onchocerciasis, to trying to eliminate it entirely. The Carter Center provided most of the initial supplies and materials, and the scientists’ and technicians’ salaries and other expenses are being funded by the Ministry of Health of Ethiopia. The lab is a major step forward for the river blindness program, said Biruck Kebede, leader of the ministry’s Neglected Tropical Disease team. The Carter Center hires, trains, and equips the laboratory’s staff. 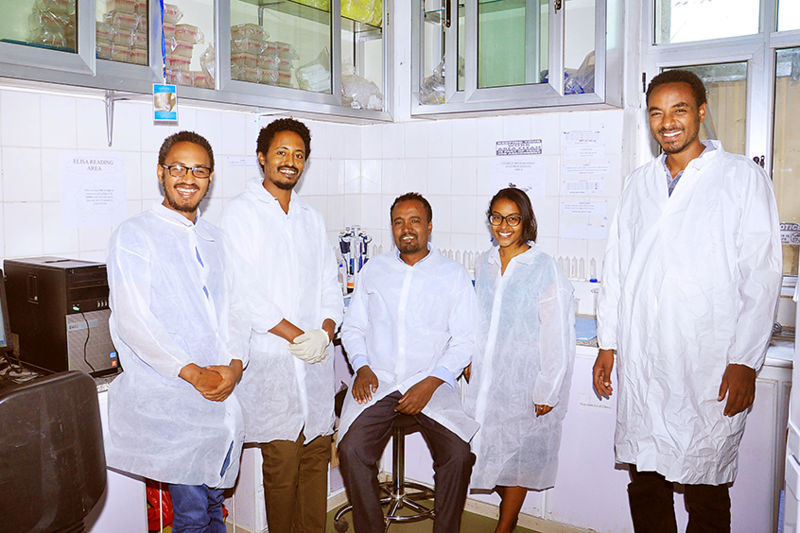 Left to right are Henok Birhanu, Fikresilasie Samuel, Tadese Asmare, Tsion Hailemichael, and Firdaweke Bekele (head molecular biologist). 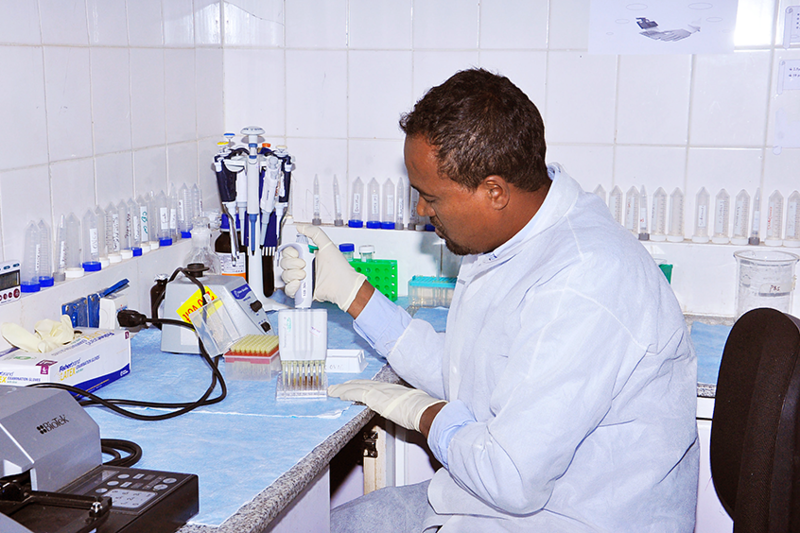 A laboratory capable of conducting state-of-the-art serological (i.e., blood) and entomological (insect) testing was essential to Ethiopia’s shift from merely trying to control the disease to trying to eliminate it, said Dr. Zerihun Tadesse, the Carter Center’s country director in Ethiopia. That paradigm shift meant changing mass treatment with Mectizan® (donated by Merck & Co., Inc., Kenilworth, N.J., USA) from once per year to twice per year, multiplying the cost of the program, Tadesse explained. That greater investment necessitated more accurate targeting of treatment areas, which the new laboratory makes possible. This work requires the collection of blood samples from many individuals and molecular analysis of the black flies that transmit the disease, “and the numbers are huge,” Kebede said. Reaching the target in a particular study zone would allow Ethiopia to halt mass drug administration in that area and begin three years of surveillance to see if the disease returned. Kebede concurred and took it a step further.